With conventional 2D cultivation using general cell culture equipment such as culture plates, cell structure and function in vitro differs from that of cells in vivo. Therefore, technology that is capable of both in vivo and in vitro 3D cell cultivation is in great demand. We have used our own proprietary materials formation technology and developed two types of ceramic plates suitable for 3D in vitro cell cultivation. A number of wells of the same shape are formed on the plate surface providing numerous cultivation areas for uniform microscopic cultivation. 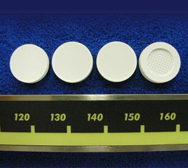 Generally, wells can be manufactured in diameters of between 100 µm to 1000 µm, and at a depth of 50 µm to 500 µm. 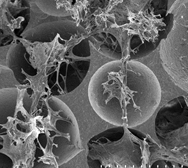 Also, the microstructure of the cell that adheres to the well surface can undergo various changes from porous to dense (see Figure 1). 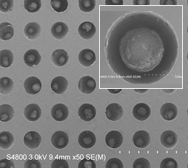 When Mouse ES cells were grown in static cultivation for three days in a microwell 200 µm diameter ceramic plate, the cells maintained undifferentiated state in the microwell and could form multiple ES cell clusters of a uniform size (see Figure 2). Undifferentiated state verification was verified with ALP activity and Oct-4 expression (conducted in the Shinshu University, School of Medicine, tissue embryology course). 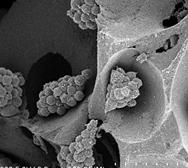 Without using feeder cells, mouse ES cell clusters were formed by direct dissemination on ceramic plates. 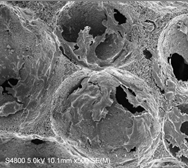 By enlarging pore channels that connect pores, cells in the plates can be easily permeated and cultivation of cells in 3D is possible in the plates. 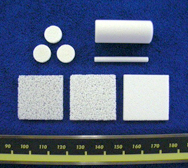 At a porosity of about 50% to 95% a pore diameter of about 50 µm to 1000 µm can be produced (see Figure 3). Stem cells that are derived from inner cell mass of an early stage embryo, or blastocyst, in the early development stage of animals and humans. It is anticipated that applications for ES cells will be developed for regenerative medicine and in other areas due to the fact that ES cells have an unlimited capacity for self-renewal while maintaining pluripotency when differentiating into all tissues in vitro.